Amir Iqbal Khan is a British professional boxer. He is a former unified light-welterweight world champion, having held the WBA title from 2009 to 2012, and the IBF title in 2011.
Who is Amir Khan and where does he come from? Amir Khan is 32 years old. He was born on December 8, 1986, in Greater Manchester to parents Sajjad and Falak Khan, with a Punjab background in Pakistan. Amir, who is Muslim, was educated at Smithills School, Bolton, and studied at Bolton Community College. Khan is one of four children, including two sisters, Mariyah Khan and Tabinda Khan. Amir’s brother, Haroo ‘Harry’ Khan is an undefeated professional boxer. Amir is also the first cousin of English cricketer Sajid Mahmood. He weighs approximately 63kg and is 1.74m tall. What other records and belts has Amir Khan held? At a regional level, he held the Commonwealth Lightweight title from 2007 to 2008. He also held the WBC Silver welterweight title from 2014 to 2016, and once challenged for a middleweight world title in 2016. 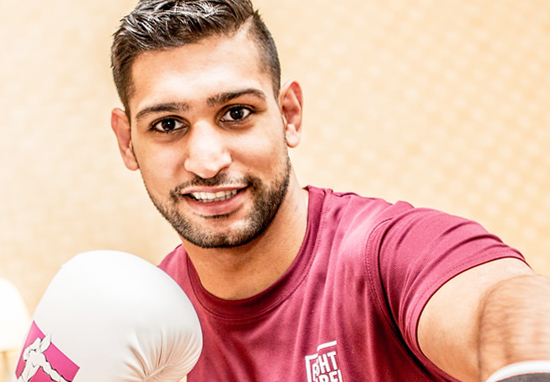 What boxing matches made Amir Khan famous? Khan won a silver medal in the lightweight division at the 2004 Olympics becoming Britain’s youngest boxing Olympic medallist at the age of 17. In early 2009, it was announced that Khan would fight former seven-time and three-weight world champion Marco Antonio Barrera on March 14, at the Manchester Evening News Arena, which he won through a technical decision. In 2016, Khan – a former unified junior welterweight – moved up from 147 pounds to face middleweight fighter and one of the most feared boxers on the planet, Canelo Alvarez (46-1-1, 32 KOs) at a catch weight of 155 pounds for the middleweight world title belt. Amir lost the fight, being knocked out by Alvarez in the sixth round. Financially, Khan has been successful, negotiating money from fights as well as TV rights. According to TheRichest.com, Khan is one of the richest active boxers in the world and is worth between £22 – £30 million as of 2013, with no reliable updates on his fortune since 2016 according to Celebrity Net Worth. He spent $1.6 million opening the Gloves Community Centre and boxing gym in Bolton. In 2013 he earned $600,000 from his fight with Mexican boxer Julio Diaz. Amir, who has repeatedly cited his children as an inspiration, reportedly spent £100,000 on his daughter Lamisah’s second birthday party. Faryal Makhdoom spent three months planning the 250-guest event which included Disney princesses, Peppa Pig and a real-life ballerina. Yes Amir Khan is married to wife Farayal Makhdoom 26, who is from Brooklyn, New York. The couple have been married since 2013 and live in Bolton. Faryal was just 19-years-old when the pair started dating and she wed Amir just a year later. Are Amir and Farayal still married? Yes. Amir and Farayal’s relationship came under the spotlight in 2017 after Amir was spotted partying with a girl in Dubai. 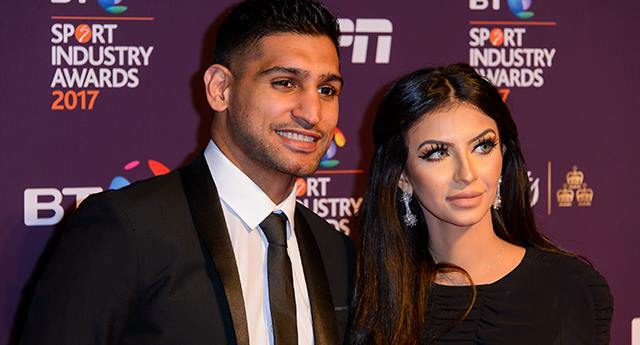 A public row ensued on Instagram and Twitter, with Amir claiming he would ‘divorce’ his wife over allegations that the model and actress had ‘cheated on him’ with fellow boxer Anthony Joshua. The couple have since reconciled and are currently still married. When is Amir Khan’s next fight? Khan returned to boxing in 2018 from a two-year layoff to sign with rival Kell Brook’s promoter, Matchroom Boxing. After knocking out Phil Lo Greco on April 21, 2018, in 40 seconds, Amir has set his sights on opponents Kell Brook and Adrein Broner. At the time of writing the dates have not been fixed, but Khan has said repeatedly that he fancies his chances in tougher matches in the summer of 2018. Did Amir Khan feature in I’m A Celebrity Get Me Out Of Here? Yes, Amir famously appeared in reality show I’m A Celeb, where he shared jungle camp with Iain Lee and other celebrities. Amir caused controversy over ‘Strawberrygate’, an incident that saw him and Iain Lee lie to the camp after they were selected for a challenge, in which the prize was food for them and their campmates. Before arriving back at camp, Iain and Amir ate the strawberries and then lied to their campmates about failing the task. The controversy went viral and viewers called for the pair to be ejected for cheating.